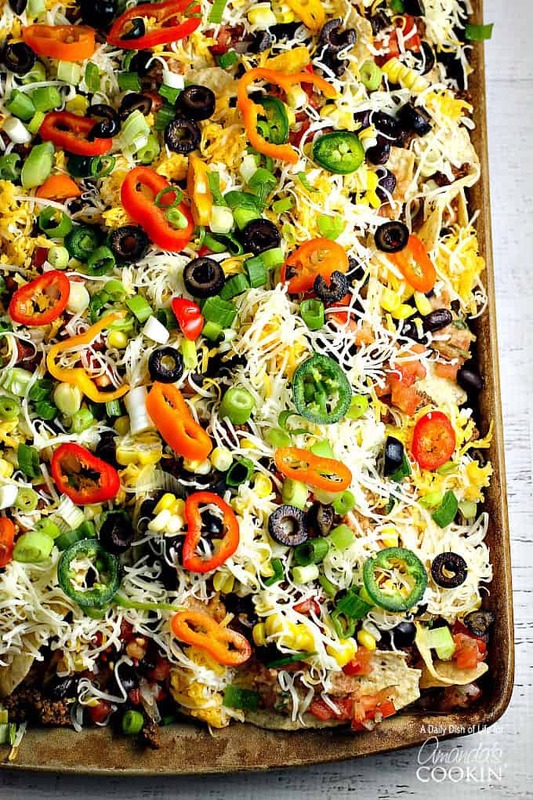 Loaded Nachos Recipe: make a giant plate of nachos for the game! We love nachos on this blog; with recipes like these filet mignon steak nachos and our rotisserie chicken nachos. 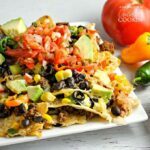 A big plate of Loaded Nachos is a popular game day recipe packed with healthy ingredients and cheesy goodness! 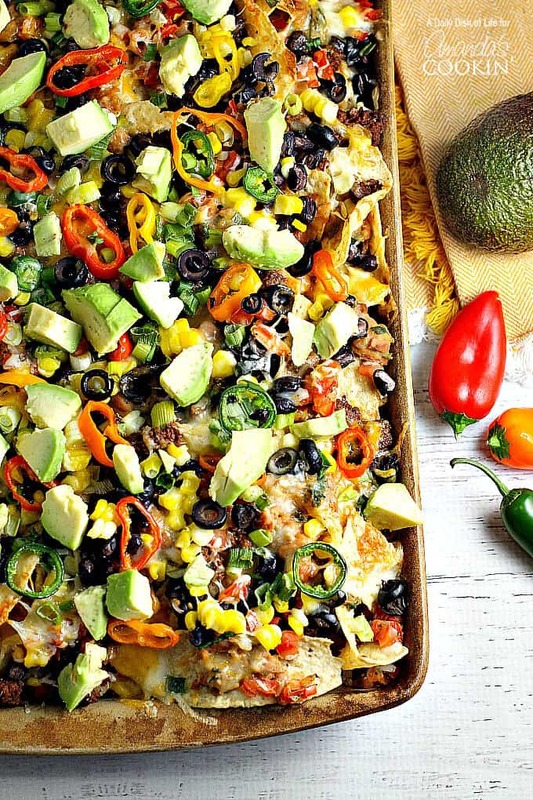 Load up a platter with your favorite fresh nacho ingredients using this easy recipe. Football season is upon us now, and that means game day appetizers! I don’t know about you, but I love all the party food munchies this time of year. I can’t get enough of them! Honestly, I could skip dinner and just eat appetizers instead, or in this case, Loaded Nachos…which is exactly what my family did the other night while we were watching college football. 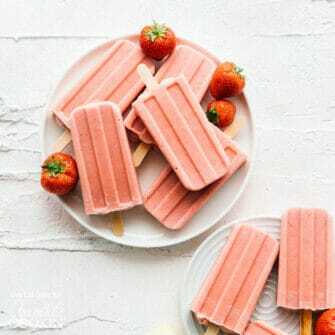 They were a huge hit with my kids and husband! And best of all, they’re so easy to make…under 30 minutes start to finish! 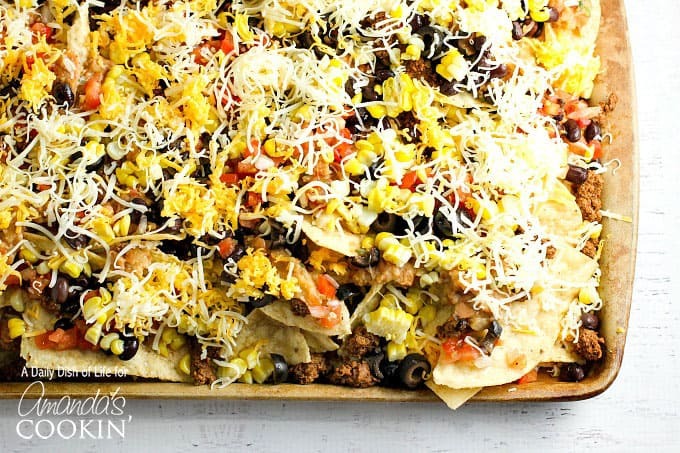 These Loaded Nachos are covered with everything but the kitchen sink! I layered each layer of tortilla chips with taco meat, homemade refried beans, black beans, a mix of shredded Cheddar and Monterey Jack cheeses, sliced olives, and corn. Then I added sliced Jalapeno peppers, colorful mini pepper rounds and chopped green onions on top before putting it in the oven. I added the drained salsa / pico de gallo and avocado chunks as soon as it came out of the oven. You can certainly use one of those taco spice seasoning packets to make your taco meat, or canned refried beans, but using the homemade version is much healthier, and tastier too, in my opinion! Here’s what your baking sheet will look like after the first layer of chips. Here’s the tray ready to go in the oven! Don’t they look good?! 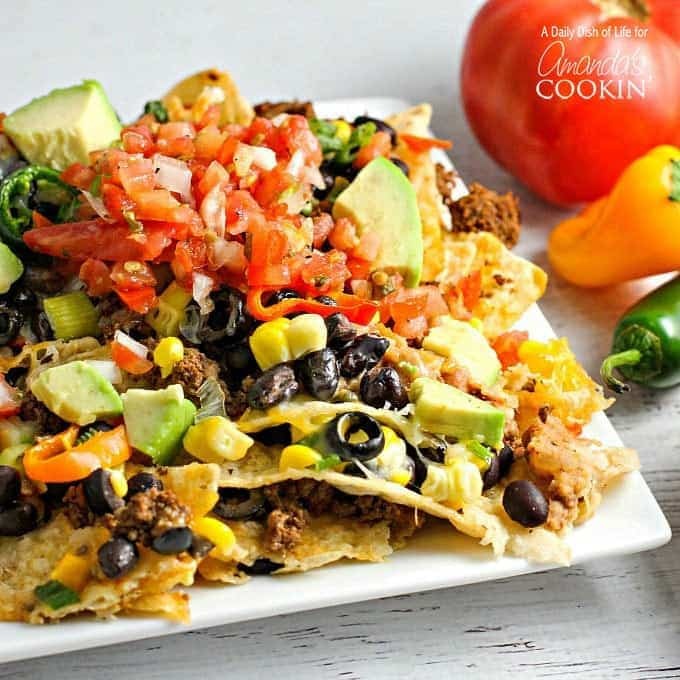 These Loaded Nachos are sure to be a big game day party favorite! If you’re looking more more nacho recipes check out these rotisserie chicken nachos. So good! 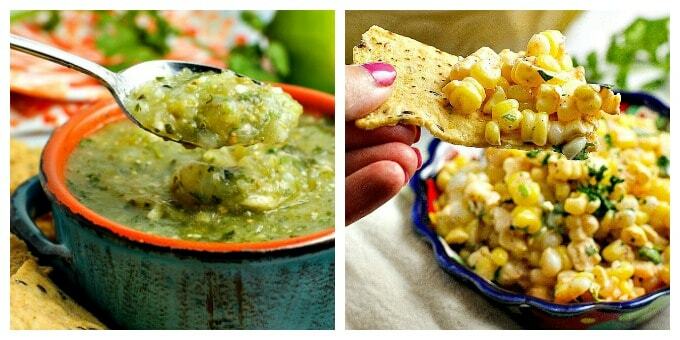 Salsa Verde…tangy Salsa Verde is quite versatile, great with chips and nachos, or over burritos and enchiladas! Mexican Corn Salad…this easy and delicious 15-minute corn salad can be eaten with chips or as a side dish! Taco Pasta Salad… an easy crowd favorite! Perfect for a potluck or BBQ! 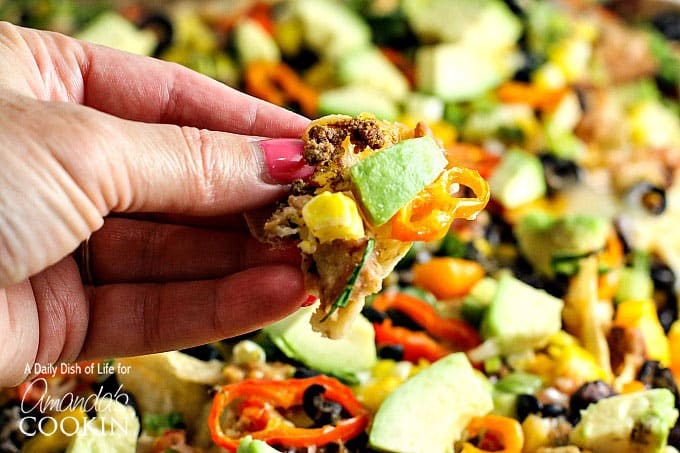 Loaded Nachos are a popular game day recipe packed with healthy ingredients and cheesy goodness! Brown ground beef; drain excess fat. Add homemade taco seasoning and water to ground beef. Bring to a boil and cook for two minutes. Line stoneware baking sheet with parchment paper. Place first layer of chips on baking sheet. 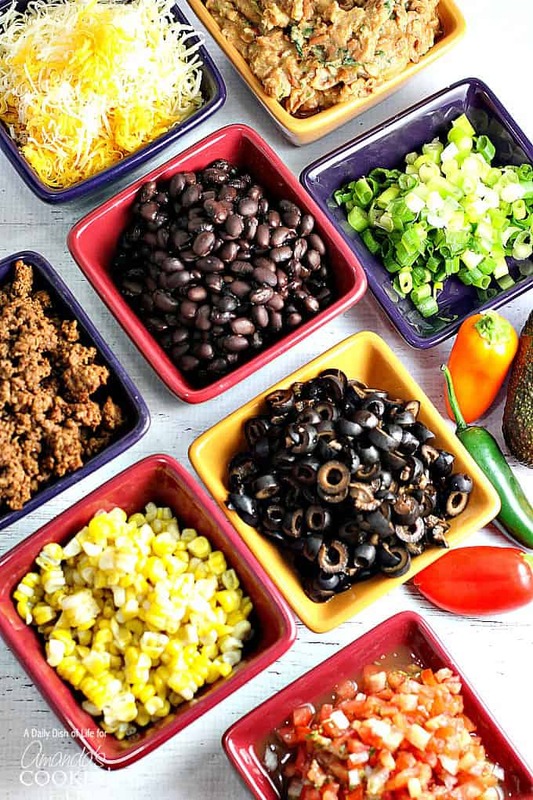 Layer taco meat, refried beans, black beans, cheese, olives, and corn. Top with chopped green onions, jalapeño, and mixed peppers. Cook in oven for about 10 minutes or until cheese melts. Top with drained salsa / pico de gallo and chopped avocado when the nachos come out of the oven. Perfect, colorful, creative ! Great ! Thank you !